inscription: "A Cut Paper Drawing By Sam Allen - San Francisco/Sa Jose / (c) San Francisco Arts & Athletics / Printed In U.S.A." in white centered at the bottom. Two blue Community Thrift Store $0.25 price tag stickers adhered on verso top corners. 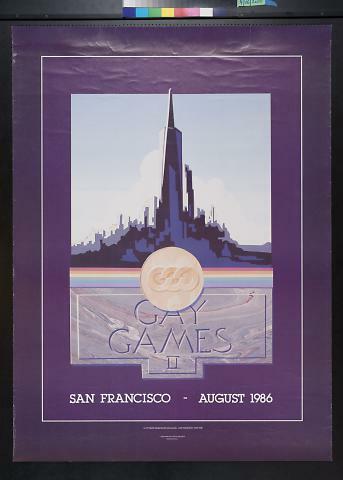 Poster has purple edges and a purple background with a stylized image of the San Francisco skyline. Below the image is "Gay / Games / II" carved into marble with a gold medal centered above, flanked by rainbow strips. At the bottom is "San Francisco - August 1986" in white.